Food is a central facet of daily life. It brings people together and allows them to bond over everyday ups and downs. It was in this spirit that members of Israel’s Nalaga’at Theater created the ensemble piece “Not by Bread Alone,” which played at NYU’s Skirball Center through Feb. 3. 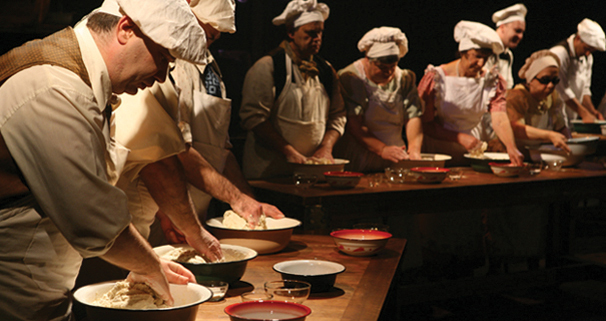 In the play, the actors bake loaves of bread in real time, sharing their trials and triumphs with the audience. Black-clad interpreters share the stage with the cast because the actors cannot hear or see. Brought together in 2002 by director Adina Tal, the troupe has performed worldwide. From start to finish, much of the play focuses on showing the condition of those performing, including their tales of living in a pitch-black, soundless void as well as adding sign language interpreters in the lobby. Beating drums give the cast their cues throughout the show. The show’s most powerful moments, however, are those in which the audience is reminded of the traits they share with the actors in spite of the performers’ obvious disabilities. Despite an unfortunate disconnect between the stories portrayed, which creates a frustrating lack of closure for the audience, Tal succeeds in incorporating a wealth of comedic moments in contrast to the sob story that the piece could have so easily become. At one point, while one actor shares his dream of becoming a bird-watcher on stage, another enters clad in feathers, begrudgingly playing his part to the amusement of the audience. In a scene where the cast re-enacts a visit to Italy, a mock pope appears on the balcony, waving to an imaginary crowd. In yet another scene during which a character longs for his wife, a cluster of men dressed in veils fawns over him until he touches their hands and is disgusted when he realizes their gender. For any group on the cutting edge of the theater scene, there will always be challenges and drawbacks to face in creating new work. Even though “Not By Bread Alone” fails to have a cohesive storyline beyond the commonality of its actors’ disabilities, its magic lies in moments in which the audience forgets about those disabilities and the story becomes focused on a shared human experience — the act of breaking bread.